UXT antibody LS-B10293 is an unconjugated goat polyclonal antibody to UXT from human, bovine, dog and other species. Validated for IHC, Peptide-ELISA and WB. Tested on 20 paraffin-embedded human tissues. UXT antibody was raised against synthetic peptide C-DHRDKVYEQLAKY from the C-terminus of human UXT (NP_004173.1; NP_705582.1). Percent identity by BLAST analysis: Human, Gorilla, Gibbon, Monkey, Marmoset, Panda, Dog, Bovine, Rabbit, Pig (100%); Elephant, Horse (92%); Mouse, Rat, Hamster (85%). Immunizing peptide used to generate LS-B10293. Useful for pre-absorption and neutralization of the antibody's antigen binding site. Human UXT. This antibody is expected to recognize both reported isoforms (NP_004173.1; NP_705582.1). Peptide ELISA: antibody detection limit dilution 1:64000. Western blot: Approx 20 kDa band observed in Human Kidney and Skeletal Muscle lysates (calculated MW of 19.6 kDa according to NP_705582.1). 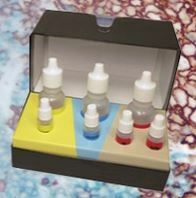 Recommended concentration: 0.01-0.03 ug/ml. 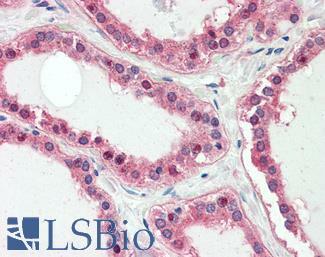 Anti-UXT antibody IHC staining of human thyroid. Immunohistochemistry of formalin-fixed, paraffin-embedded tissue after heat-induced antigen retrieval. Antibody concentration 5 ug/ml. 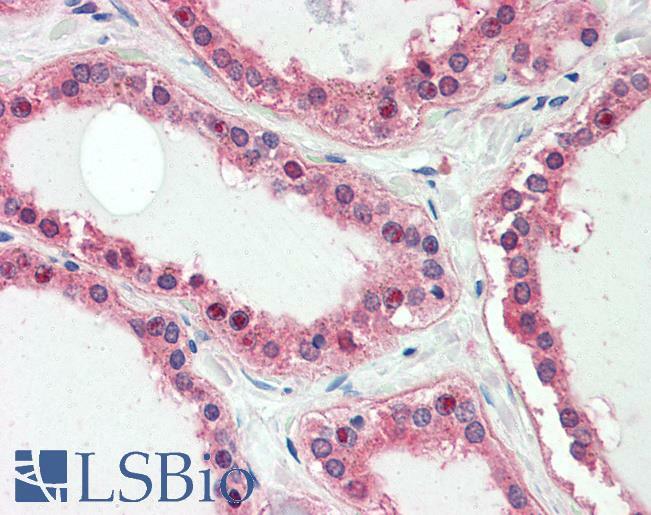 UXT antibody (0.03 ug/ml) staining of Human Kidney lysate (35 ug protein/ml in RIPA buffer). Primary incubation was 1 hour. Detected by chemiluminescence.